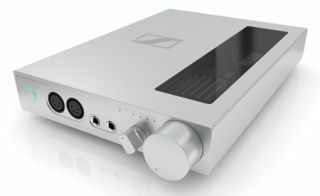 HIGH END 2012: Sennheiser debuts HDVD 800 digital headphone amp | What Hi-Fi? We missed this new Sennheiser headphone amp when it broke cover in April, but spotted it at the High End show in Munich this week. The digital HDVD 800 has a fully symmetrical layout and can handle sampling frequencies of up to 24-bit/192kHz. It's been developed to work particularly with Sennheiser's HD series of high-end headphones. Sennheiser provides a specially made cable for a symmetrical connection from the headphones to the amp. The headphones can also be connected using a normal 6.3mm jack. For use with digital sources, the HDVD 800 is equipped with a Burr-Brown digital-to-analogue converter (DAC). Digital connections include an AES/EBU input, optical, coaxial and USB sockets. The USB 2.0 port offers 24-bit data transmission at 192kHz. A rotary gain switch on the rear of the amplifier provides regulation of the amplifier output to the audio input voltage. Both the housing and potentiometer control, as well as the rotary switch for source selection, are made of anodised aluminium, while the front panel and other controls are milled from solid material. "With the HDVD 800, Sennheiser is... providing the perfect combination of Sennheiser headphones and a specially matched amplifier," says Maurice Quarré, director of Sennheiser's product lifecycle management. The Sennheiser HDVD 800 will be available in Europe from September.